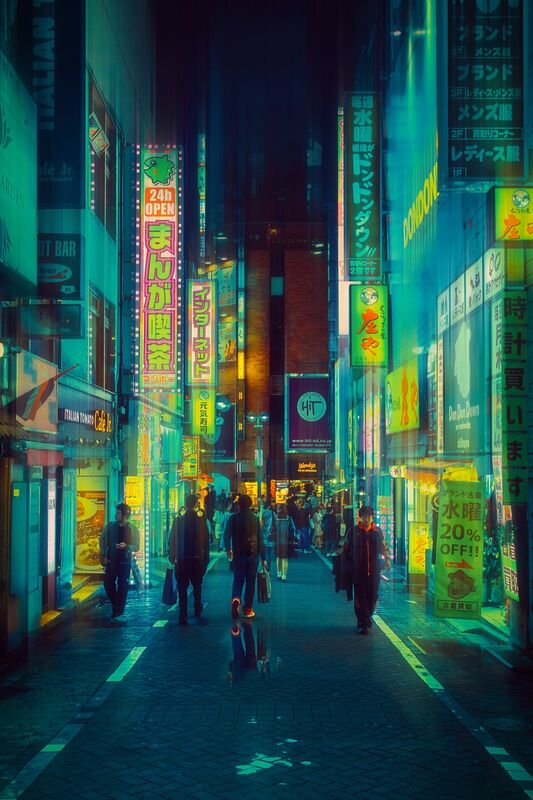 Inspired by his favourite films – Blade Runner, Akira and Enter the Void – as well as video games like Final Fantasy VII and Snatcher, these photographs are seductive, nostalgic yet manage to capture the modern vibrancy of the world’s largest city. The pictures are stunning and well worth looking have a look at. But I have to say and no disrespect to Davide, Tokyo just looks incredible at night full stop. Its a shame my lens on my camera wasn’t clean as theres lots of smear marks in my photos. I recently went to Iceland for a holiday. It was quite an eye-opening experience. The landscape was very different to what I’ve ever experienced recently and the cost of food and drink was shocking. The people were mainly friendly and the Reykjavik although small was full of interesting corners and little boutique stores. Rather than writing a bunch of stuff, I thought I’d pick out some interesting points in my many photos (over 800 believe it or not) I took. The food in Reykjavik was bloody expensive only topped by the price of alcohol. I never quite got to the bottom of why everything consumed was so expensive but a normal meal which would cost you about 20 pounds here, would come to closer to 35 pounds there. Theres some odd things I found too, including the pork scratching puffs on the meal above. The Harpa is an amazing concert and conference centre and is stunning to look at and be inside of. I was there for a whole just snapping away and gained access to a private party, as I just wonder around. Decided not to take the free champagne as that would be too much I felt. Especially once the black tie party started coming in and someone took to the piano. At Harpa I was able to soak up some jazz from a visiting group from America. They were good but felt slightly stiff in their white shirts and ties. Afterwards the local Reykjavik jazz band took to the stage in a much more colourful attire and to be fair they were a lot better. Because of the barren landscape (learned all the things we think of as trees in Iceland are imported, as their trees are usually about waist high and more like bushes), the transport very different. They ranged from crazy moon buggy truck like things to Nissan leaf electric cars. I gather the price of electric is quite cheap due to lots hydro-electric and energy from the natural landscape. Iceland is a beautiful country but so weirdly different. Everywhere you looked was mountain rages which were huge. Always covered in snow and surrounded by clouds. Unlike elsewhere I have been, there this black material which I think was like tar. It was amazing and very robust unlike soil/dirt I have seen elsewhere. Dawn in Reykjavik was also beautiful, and I was lucky enough to be in a Airbnb room with a skylight which opened wide enough to maybe even climb out of. So one morning, I woke up to use the toilet and snapped a few shots before going back to sleep. I also find the icelandic humour playful too, as seen in the single gloves dating site and coloured houses. The street art of Reykjavik was great to see and plentiful. Brian said a lot of the bigger stuff comes from the Iceland Airwaves festival, which is a big thing every year. I imagine in a small city like Reykjavik it really would take over. I still find the new Icelandic traditional of Hotdogs after a night out, very weird. I guess others would find the same of the british idea of kebab’s strange. Heck I find the idea of gravy and chips weird enough myself. Of course things like the Swimming in the outdoor pool while it was 3-c, the Golden Circle was great and generally I was lucky not to be caught in a snow storm or even much rain. It was cold yes but not as bad as I thought it would be. I took too much winter clothes but really enjoyed myself, even with the weirdness of my airbnb experience once again. It all started when I came back from Tokyo to find my Spideroak storage full. I decided a terabyte of photos which are hardly private in a super secure storage is a little crazy and its time to put them somewhere else so I can make use of the secure storage better. Originally I did look at using Amazon Glacier but quickly found out that its really not for general use in any shape. I looked at trove again to find trovebox has been shutdown… but there is a Github community project for those wanting to keep developing. We’ll be shutting down the hosted Trovebox service on March 31, 2015. We may extend this deadline to help accomodate customers to obtain archives of their photos. A few of my friends said why don’t I use Flickr, especially since I’m already a pro member and have been since 2004! I thought about it, because I tend to use Flickr to only upload photos I actively want to share rather than a place to upload all my photos. Basically I never really trust the privacy options and only upload things which I’m happy being public. It was time to trust Flickr’s privacy model but to be fair I’m still only uploading stuff which it doesn’t matter too much if its public. Started doing that then Google announced at IO 2015, a revamped photo service with unlimited storage (if you are happy with them converting them down a bit). This has got me wondering, if I should switch? Economically it makes sense to stay with Flickr as its unlimited even on high resolution photos and I have most of my good photos already there (incumbency advantage). But the google space purchase would only be used for photos over 2048x2048px big. Which I guess is quite a few as I switched to 5mpx and above very early on . I guess there’s the option of trusting googles image compression. I guess having the extra space in google drive would be useful but its not a big deal yet. I’m going to keep uploading the photos and let google photo shake out a little. When the next year of Flickr comes up, I’ll decide then. Even made a google task to remind me. Hopefully there will be flickr to google drive exports or I’ll have gigabit internet and can upload the lot super fast. Tokyo… So what did I think? On reflection on this post and all the posts I did during my time in Tokyo starting with I’m dying to experience Tokyo by 2016. Forever I have wanted to experience Tokyo. For me its always been a place of technological progress. I know its not for everyone, but the culture is so wildly different and technology is at the core. So why have I not already been? I lived with a Japanese lady for a while and we would talk about me going to Tokyo. She always pleaded with me, please go with someone who can speak Japanese because my allergies will kill me. Technology like Google translate really made the difference on this front.People have asked what my high and low points were in Tokyo/Japan? The Airbnb for the first week was fine, it was quite nice having a place with Rebecca. But the second week when Rebecca went off to western Japan, I moved to a smaller shared airbnb apartment. What I didn’t know was how small it really was. There wasn’t enough room to get out the door as my suitcase blocked the very narrow walk way by the futon. I did wish I had taken photos but I was so worried about it ruining my whole holiday, I went looking for an alternative hotel straight away. Luckily I met Alexandra after Herb Kim told me she recently moved. And she was able to help me find a great room in Nippon. I did finally get a refund from Airbnb, although they thought I was in the wrong? Trying to get to Nagashima Spa Land the first time and standing on the wrong bullet train between Nagoya and Yokohama for over a hour, was also a pretty low points too. Right from the flight on the Airbus 380 to Dubai with USB, mains power and wireless internet to each seat. Also nicely got the exit row at the very front with more than enough room for the tallest NBA player. Meeting up with Andy Budd and Alice who happened to be in Tokyo too. Having sake in Shibuya with them and the rest of the UX workshop, then seeing the sights and sounds of Shibuya. It was exactly how I imagined Tokyo would be like and it didn’t disappoint at all. I couldn’t walk down the street without taking pictures every few steps. Experiencing the insanity of the Japanese passion for the make believe in Anime and Cosplay in real life via the Robot Restaurant and Harajuku. The Robot restaurant was totally mind blowing. It was a real world anime with every move being better with a bigger and better come back. Honestly nuts and the audience were loving it. I kept saying only in Japan would this work. The many theme parks I visited including Tokyo dome, Nagashima Spa Land and Fuji Q highlands. Thunder dolphin at Tokyo dome was frustrating due to the crazy following of every single safety rule but when I was on, it was surprisingly fast and the drops were pretty epic. Steel dragon 2000 at Nagashima Spa Land was the winner of all, having me grab the rails on the first and second drop. After that one time I was back to my usual hands up when the G force wasn’t so great. Riding the bullet train (Shinkansen 新幹線) was quite an experience. At first I thought it wasn’t much faster than most of our trains at full speed. But then it got out of Tokyo and suddenly you can feel the gravity pushing you into the back of your chair. It really shifts! The Olsen (Japanese Spa) I went to in Tokyo dome was great, yes it was very weird being naked and having to wear their clothes (which didn’t quite fit) when moving to the mix floor. But even with the weird looks from the also naked Japanese business men. I found the whole experience pretty good and I enjoyed it enough that I stayed from about 2230 till 0230! My experience was so rewarding that I’m going to seek out one in the Manchester area and visit at least once every 6 months. Shopping and browsing in the electric district of Akihabara. I spent quite a few half days there and it blew me away how big the district really was. I explained it to friends as the size of Manchester’s shopping centre but all electronic markets and shops. I also went looking for Nikon lens (where else better than Japan?) for my aging Nikon D40X DSLR and ended up finding a basement the size of my apartment in Shinjuku, stocked full of second hand lens which ranged in price from cheap (£15) to stupidly insane (£3000+). It was called Chuuko Box, the tip was to go downstairs, this place is a treasure trove! I was so blown away, I decided to duck out and learn more about lens because I was obviously out of my depth – in a way I’ve not experienced in a long time! I did Karaoke in Tokyo with Alex and Len after I moved out of my terrible Airbnb. I don’t usually like Karaoke because I don’t know most of the songs and never had much of a singing voice. But singing away while drinking sake after the nightmare I almost had, was such a great relief… It was of course also great being able to share experiences to date. As I spent 2 weeks in Tokyo, I also quantified my walking and sleep. Here’s the numbers from my fitbit. The sleep quantified data is under lock and key but generally I slept less and less over the holiday but I spent more time in deep sleep than REM sleep. Talking of sleep, it was scary how many people I caught sleeping in public. I assume its something to do with the very work loaded culture. Visited Shibuya crossing four times and crossed it 12 times. Eat goodness know much meat! Went one weight and came back 2 pounds lighter! Took 989 photos and uploaded only 628 to Flickr. I was wrong on many counts with Japan but I’m happy to see the techno-wonderland I thought it was going to be. There are scary tales of where the technology unchecked will take us. Author IanforresterPosted on May 3, 2015 May 6, 2015 Categories culture-and-politicsTags culture, holiday, japan, life, photos, qs, quantified, tokyo7 Comments on Tokyo… So what did I think? The spotlight effect in times of the #selfie? Having a great little conversation with Alexandra deschamps-sonsino about how she doesn’t like watching herself giving talks and presentations. I expect that applies to most of us (including myself), but I did say this could be the the spotlight effect in full effect?. Alex had a look at the wikipedia page about the effect and asked me how does this work with the craze for selfies? I was totally stumped… I have no idea but some PhD research student needs to look into this… Seems like a fruitful area of research? I’m sure Sherry Turkle (again) would have lots to say about this. Author IanforresterPosted on August 15, 2014 Categories culture-and-politicsTags alexandra-DS, photos, research, selfie, spotlight, spotlighteffect1 Comment on The spotlight effect in times of the #selfie? Herb Kim the founder and creator of the Thinking Digital conference. This is my usual best of Thinking Digital… Bear in mind I missed half the conference as noted here. Julian Treasure got us thinking about our hearing and how important it is. I specially liked two statements he made. Sound has a impact on cognition and don’t architects have ears? He pointed to some very nice spaces with apple styled touches. The kind of place most people would agree is nice but once he mentioned the amount of sound bouncing around the surfaces and reflecting off the floor, it was a different matter. Maggie Philbin is one of those people who you grew up with on screen and she had become a geek hero of many men in the UK. The Tomorrow’s world presenter talked about technology for a bit then got around to her main points about the lack of diversity. Something about hearing it from Maggie really laid it out for lots of people. I had the pleasure of seeing Maggie giving the Perceptive Radio a once over too. What a woman! Aza Raskin I have had the pleasure of meeting before years ago when he was working with Mozilla. Then I also got to eat dinner with him during the first night with others. Aza is one of those people who you can’t help but like. It was a really interesting time chatting with him too because his company Jawbone had just bought Body Media for 100million. Aza had no problem with talking about such things and was happy to talk about the quantified self elements of Jawbone including the wrist band Jawbone up. It was even more interesting to me after just been at the Quantified Self europe conference a week before. Aza’s main point was about Design being the art of turning constraints into solutions. But are we actually asking the right questions? Do we even really understand the problem were solving? Lots of food for thought… And I’d love to know more about the Jawbone hack! Sugata Mitra is always impressive and was one of my highlights of last year but with New Zealand teachers Jo Fothergill & Tara Taylor-Jorgensen who had flown 1000’s of miles to come talk at Thinking Digital the talks were even more epic. You can’t help but feel the educational system will be fine when he talks. I also had the joy of hooking up Jo and Tara with mr whirl wind Alan O’Donohoe before they flew back to New Zealand. Chance and opportunity came together at just the right moment I think. Graham Hughes on reflection was maybe the best talk of the conference. On New Years Day 2009 Graham Hughes, set off on an epic journey from his hometown of Liverpool. He wanted to show that the world is ‘not some big, scary place, but in fact full of people who wanted to help you.’ He used buses, taxis, trains and his own two feet to travel 160,000 miles, 201 countries in exactly 1,426 days – all on a shoestring of just $100 a week. I’m not usually the biggest fan of the talks about the amazing things people have done but there was something extra special about Graham. He was just a everyday Jo. He made it into every single country on planet earth without flying not even once. Such a epic story and the story was told so well with some incredible sub-stories, when the videos come out for Thinking Digital 2013, you must see this video. Epic and so down to earth. I also like to think I helped him with an introduction to someone I know at YouTube. I believe his storys are good enough to make him a bit of internet superstar, hopefully the youtube connection will be the start of it. Actually I need to check in and see if anything happened? Jack Andraka I didnt’ quite get at first but as he told his story how he applied his mindset to the problem of pancreatic cancer, after losing a family friend to it. Using just Google he researched a new pancreatic cancer test that is 168 times faster, 26,000 times less expensive and potentially almost 100% accurate. He’s only 17, openly gay and already been described as the Alan Turing of our age. His talk was exactly what you would imagine from a 17 year old guy. All over the place but understanding the gravitas of what he was explaining you couldn’t help but feel how epic his journey has been. I really wished I had stopped and chatted to him in the hotel the next day, could have called a taxi and still have made the train. Tom Scott… What can I say. A talk you can only really do once and once only. Fire and Tom’s hoody, heck what more can you ask for? No but seriously Tom delves into the idea of archiving our memories. This is something I tried to do a while with my old phone. Memories are funny things, and they certainly make you pause for thought. I for example have my yellow Brazil football top, I’m surpised it even fits from 1998! The same year I went to Ibiza and go that crazy Brazil haircut. Maybe I should set fire to it too? I already talked about Aral Balkin in a previous blog but he was rather good even if I disagreed with a lot of what he was saying. Well rehearsed and cleverly put together for the maximum effect each time. I won’t take that away from Aral, well done. Chris Thorpe and Rachel Armstrong for expanding our minds further than I could maybe take at that moment. My notes are pretty flat but I remember being slightly moved by what they were saying. And finally, Alexa Meade for simply stunning pieces of art which I had only seen once or twice. Important never to forget the impact art can have in a new medium. Painting directly on to people is something very special and the time and dedication really impressed me. She was such a lovely lady too. I don’t know if I would ever let anyone paint on top of me. The feeling of uncleanliness would maybe drive me slowly nutty. Spent some lovely time with my parents and godchildren over the Easter holidays. On the Sunday night me and my mum was sitting down after our lovely cream tea for supper. I was showing mum some stuff and somehow got on to the subject of online dating. As you can imagine to my parents the whole thing is a little removed from reality but anyway, I decided to show her the kind of people who use it, mainly to point out there not all fruitcakes. In Okcupid there’s a mode which is best described as hot or not. Instead you choose a rating from 0 to 5 stars. It was a quick way to show a flavour of woman without getting too bogged down in the details. As flicked through I asked my mother what she thought of the woman’s photos. It was fascinating hearing my mothers view on the woman’s photos and glimpse of personality in what they wrote. Generally my mum would look at the photos, if she liked what she saw, she would start reading the profile. Nothing new there I hear you say. But it was the woman who she choose to read more about which interested me. If I could generalise, I would say it was somewhere right in the middle. She liked to see the whole face in one photo and the whole person in the next one. She was not impressed by woman drinking beer and low light photos full stop. She was also not a fan of photos showing lots of cleavage or flirty photos. For example a picture of a woman on the floor with her legs open facing away from the camera in stockings received absolute scorn. Of course it was playful and didn’t show anything but it didn’t matter… Scorn and burn! She didn’t seem to like single photos either, specially if they were trying to act cute. She also didn’t like the look of the boyish looking woman, think my mum likes woman to look like woman. She also needed more that one photo to make a good decision, which makes sense. With the profiles she read, she glossed over interests like films, etc. But liked it when the woman talked about cooking or food. Even a few who talked about baking cakes. Thats done by looking at all the woman my mum ticked high and averaging the scores. Its far from scientific with only 8 woman my mum rated as very suitable for myself. I would say the woman were generally younger looking and in age. Bear in mind I only showed woman within my filter of 26-38 and less than 50miles away. Anyway… Once I get them the Chromebook, I’ll have to seek more matching advice from my mum as it was fun and interesting at the same time. Most people know how much I really hate Facebook, although in the last few months I’ve slightly warmed to it for certain things. Recently I scanned all my old negatives into jpgs, and I’m not sure what to do with them? Normally I would upload them to Flickr.com like most of my photos but to be honest I only upload the best of my shots to flickr.com (even though I have a pro account and I have done for the last 4+ years). It just didn’t make sense to upload the old crusty scanned pictures to flickr.com. So I had a think and decided that the best place to publicly put them is on Facebook. Yes the EULA still really bugs me and It probably means Facebook now owns my photos but heck, there so old and crusty, that I don’t really care. Better online somewhere that lost in negative form forever? I also reckon theres roughly about 300 of them once you take out some of the duplicates (I did the scanning over a few days and didn’t really do a good job of splitting the done and to do piles, so shoot me). No one really wants to see my photostream full of old crusty photos for almost 300 photos… Heck not even I want to see that. So I’ll use facebook as I’ve been using it previously, a massive dumping ground for publicly available data. I’ve marked the photos as public, so it will be interesting to see what that means in the great scheme of things. I’m aware there is some facebook event later today but I doubt its anything which will change my view on facebook or using it. So old friends of mine, do check out the tip of the iceberg collection i’ve uploaded so far under school days (I was tempted to write skool daze but I don’t want to encourage the super lameness which comes with facebook stuff). I’ll upload the rest once Facebook stops telling me to update my flash player or I can be bothered to deal with the crappy html uploader. Yes in Inkscape at full scale (1:1) using lots of layers (12 to be exact). Each square is a meter squared by the way and I got the chance to look around my flat earlier this week, so I got the measurements and photos then. So following on from this post, I'm impressed by my mini-cards and will be buying 100 soon. On February 15, 2006 I discovered that the photo sharing site Flickr had reached 100 million hosted photos. Today (September 22 2006) at 11.18 PM CET, only seven months later, Flickr passed the quarter billion mark – 250 million photos. It maybe that Flickr is doesn't have the number of people that Yahoo Photos might do, but I very much douht that the quality and quanity of photos is anywhere near flickr. I do wonder the percentage which are creative commons licenced however.